Somehow, when “Finding Nemo” came out in theaters the first time, in 2003, I missed out on seeing it. I can’t remember if it was a lack of other people who wanted to go see an animated film or if I was just too overloaded with grad school and work to notice that there were movies in the theater. Regardless, there’s no time like the present to catch up and see a really cute film. The story opens with two clownfish parents, Marlin (the truly wonderful Albert Brooks) and Coral (Elizabeth Perkins), cooing over their bountiful brood of baby clownfish eggs. Circumstances interrupt their joy, seeing as how the ocean isn’t really as peaceful as all that, and we’re soon left with Marlin carefully cradling a single egg and calling the baby fish therein “Nemo”, the name Coral had wanted at least one of the babies to have. 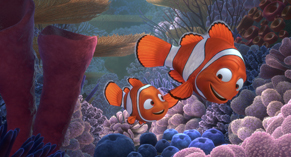 As the movie then quickly fast-forwards to Nemo’s first day of “school”, you see that Marlin’s experience with loss has made him a neurotic mess. This is exactly where Brooks shines, and as a big fan of his prior works as neurotic messes in movies like “Broadcast News” and “Defending Your Life”, he’s just the perfect casting for the role. Marlin’s adventures are fueled and facilitated by Dori, a blue-finned and forgetful fish voiced by comedian/talk show host Ellen Degeneres, in easily the most flexible role of her life. She was really astonishing in this role, as she pitched from silly to sweet and back again. 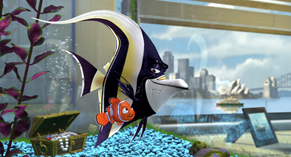 Nemo’s tank-based adventures are directed by Gill – an angelfish with an attitude, cleverly voiced by Willem Defoe – and the fish is as no-nonsense as Defoe has ever been in any of the roles where I’ve seen him before (such as “Wild at Heart”). Other supporting actor gems include Nigel, a kind-hearted pelican, played by Oscar winner Geoffrey Rush, and an entire school of fish voiced by Pixar mainstay John Ratzenberger. The movie swings back and forth between the two sides of the story – the penitent father who fears everything but ultimately risks it all to save the son who’s willing to try anything because he doesn’t really understand the value of maturity and wisdom. Both move along quickly in their progression, Marlin coming more out of his shell and testing his limits, with Dori either leading the way or (unwittingly) forcing him to risk his life, while Nemo learns about patience and persistence under Gill’s tutelage. Marlin’s journey through danger and wonder is clearly a metaphor for what every parent experiences as they try to raise their children; you’d walk across glass to save your child, if you could, and the fish version may just include swimming into water infested with sharks, jellies and other nasties that show the darker side of life in the ocean. Nemo’s maturity is accelerated but seems right in line with what all children eventually have to learn about independence, patience, and determination. And then we get to the 3D. Really, I think it was just very nicely done. At no point did I feel like it was distracting or overbearing; the 3D work gave the film depth without having fish flying at your head. Many of the effects were subtle and simply made it seem a bit less like a flat, two-dimensional cartoon. In other words, it worked really nicely. DD, who attended the screening with me, gaped at the screen when she finally allowed me to put the glasses on her head. “It’s like you’re IN the movie,” she gasped. Why yes, that’s how it’s supposed to feel. My only potential beef with the movie is in the rating. 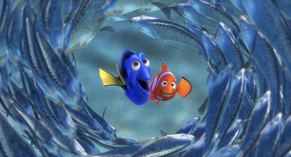 While it’s rated G, there are clearly a number of scenes where Marlin, Nemo and other key characters are put at considerable risk or where there are “scary” parts. I’m not sure that this should have been rated PG, but I can say that dd spent the first half of the movie with her head in my left armpit, and it took a considerable amount of convincing to get her to dislodge it. Given that she’s at the low-end of the target age (five, turning six in a couple of months), it’s possible that she just wasn’t as ready for it, but this wasn’t her first viewing of the film and her experience seeing it the first time caused her to worry about seeing it again. So, take that for what you will. If you bring small children, they may or may not react well to the scary parts. Overall, I think Pixar did a great job with this one. It’s a cute film with really excellent acting and the usual high-quality Pixar animation, this time with the 3D effects to add a little more realism to the display. For those looking to bring their kids to a fun film that’s gorgeous to watch, this is definitely worth checking out. “Finding Nemo 3D” opens nationwide on September 14, 2012. This movie is rated G (General Audiences). This entry was posted in movie reviews and tagged 3d, disney, finding nemo, finding nemo 3d, movie, movie review by crunchymetromom. Bookmark the permalink. I thought Bruce the shark was a bit scary in 3D, especially for kids! Otherwise I thought, like you, that it was nicely done.